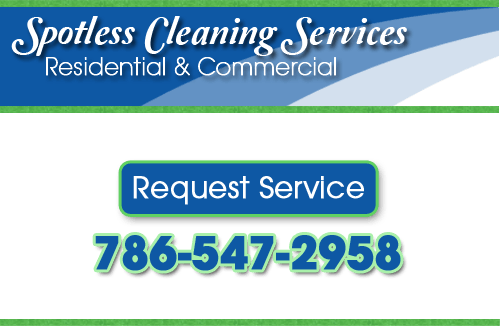 At Spotless Cleaning Services, we provide professional housekeeping services to keep our clients’ homes neat and organized. There are a variety of reasons why you might consider hiring a professional maid service to clean your home regularly. If you and your family are very busy, you can quickly reduce your stress by hiring a Miami maid service to handle basic cleaning around your home. Our cleaning specialists provide weekly or monthly house cleaning, as well as deep-cleaning services for when your home really needs the extra attention. We’ll clean all areas of your home, including kitchens and bathrooms, carpet, tile, and hardwood floor cleaning, baseboards and walls, and more. Regular maid service is also beneficial if you have a larger home, or if you’ve got a hard time maintaining your home due to mobility issues. Let Spotless Cleaning Services keep your Miami Home looking beautiful! We can customize our house cleaning service to specifically meet the needs of your home and family. If you’re looking for maid services in Miami, please call us at 786-547-2958, or complete our service request form.